Americans are the third heaviest people in the world! Yes, I’m American, and my country is full of fat people. It’s the truth. 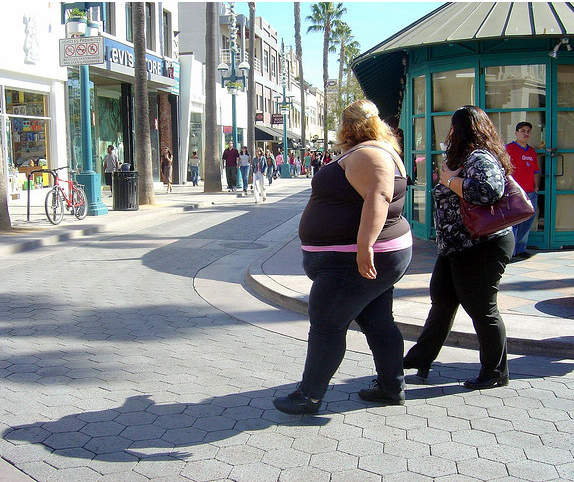 With the average adult weight in the USA coming in at over 180 lbs, and the third highest in the world, you better bet there are some pudgers NOT walking the streets (they wouldn’t be fat if they did). Armed with a degree in exercise physiology, a personal training certification and years of traveling abroad under my belt, I’ve always wondered why are we Americans heftier than the rest? Here are a few personal theories. In the birthplace of the fast food chain, America is littered with more McDonald’s, KFCs, Wendy’s and Taco Bells than you could ever visit in one hundred lifetimes. While these “dining” establishments truly keep lower income people alive and allow a family to eat, they are shortening people’s lifetimes on the whole. I credit them, most chains have made efforts in recent years to “clean” up the menus a bit, but the problem isn’t necessarily the food, it’s the cheap price. For average combo meals coming in at around $5, anyone can afford a meal. You can not buy healthy foods for that price point in the USA, and even if you opted for the Supermarket, you are only going to be able to afford processed pastas and carbs for a low budget. In other parts of the world, like when I was just in Paris, fast food chains are considered a “treat” and visited sparingly (not to mention the portion sizes are half the size). This is because fast food from one of the big chains in other countries isn’t cheap. According to numbeo.com which provides cost of living information for almost every country, the average combo meal price at a McDonald’s in France is €7.33 (over $9!). That paired with the fact that the people being employed at the fast food chains in other countries aren’t usually being paid minimum wage (or if they are it’s more than 7 bucks an hour normally), you have a pleasant experience, a clean restaurant and somewhere you could even ask someone out on a date and not be considered a cheapskate! The USA is the birthplace of the suburban sprawl. With virtually no city over a few hundred years old. We Americans have perfected the city grid system, and lucky us, have the real estate to send our “cities” for tens of miles in each direction outward to complete expansive suburbs, where everyone can have their very own single-family home, white picket fence and two-car garage (with two cars in it). What this leads to is dependence on the automobile to get anywhere of interest. I grew up just 6 miles from the epicenter of downtown Philadelphia (one of the first suburbs outside the city border), but the closest store was still over a mile away. Sure, when I was a kid, I’d love to run from place to place, but as I began to get older, and more busy and rapid rush like most Americans, I hopped in my car to get everywhere, barely touching my feet to the ground unless I had to. Winter time? forget it, I never walked anywhere. If you visit Europe, you’ll see a different urban layout layout where the majority of the population lives within a city proper, and a few people live outside and drive or commute in. City centers are much more pedestrian friendly and people walk, bike or take public transportation if need be for longer hauls. This consistent walking really helps manage waistlines and something that we’ve lost here in America. You’ll even see people eating more unhealthy in Europe or Latin America, but those extra calories are mitigated by the increased movement. Believe it or not, you burn the same amount of calories if you walk or run a mile. It’s just basic physics, Work = Force x Distance. If you’re moving a load (i.e. you) across a given distance, it takes the same amount of force to get you there (i.e. caloric expenditure), the only thing is you might get there faster by running (and burning a few extra calories returning your body to a basal metabolic state afterwards). This means that you can get just as lean by walking, you don’t need to be sprinting at the gym to shed pounds! I’ll admit it, I’m guilty of this one too. Us Americans love processed foods. They keep fresh much longer (ever had an apple that lasted for months? ), are usually cheaper and hell, taste better most of the time! People in America are becoming obsessed with organic foods thinking there is a better taste, but the truth is they don’t, they don’t last nearly as long and half the time, they aren’t even truly organic. The problem with processed foods is all of the chemicals we’re ingesting are full of chemicals and preservatives that can’t be healthy to consume in large amounts. They are often high in sugar and sodium which leads to weight gain and are a big problem with another epidemic we have in America, Diabetes. In other countries. Things are grown locally, or sent from nearby. This means certain foods are truly only available at certain times of the year. In America, we are obsessed with having everything we might desire on demand at our massive supermarkets where food is coming in from all over the world where the season might be right for the given product. The only way this is possible is by pumping them full of chemicals to stay “fresh” for the long trips and extreme weather they might encounter en route to our tables. My proposed solutions? Up your daily caloric expenditure by being mindfully active. This means take the stairs, walk if you have the time and the distance isn’t too far and spend 20 to 30 minutes doing something active per day minimum. In regards to food, try and eat what’s fresh locally at the time of purchase, you’ll have a better chance of it not being pumped full of nasty insecticides or hormones. I also think there needs to be more involvement from the health department in creating incentives for eating healthy and exercising, especially with the overhauling health reforms just passing. It would be in their best interest to subsidize families or companies to offer healthier foods at a lower price, offer tax deductions for those with gym memberships, etc. But until then, God Bless Fatmerica! Posted in France, Inspiration, USA and tagged with America, Eating Healthy, France, McDonald's, Obesity, Paris, Supermarket, USA. RSS 2.0 feed. 5 Responses to Why are Americans so Fat? If you shop at Save-A-Lot or Aldi, you can eat lean meats, fruits & vegetables, and other real foods relatively cheaply. While the low price of fast food plays a role, I’d lay the blame on overall low cost of food. A bias toward fast food among fat Americans is more of a personal choice than economic. Driving is the other major player. Greatest economies of scale in history of food + greatest mobility : effort ratio = fat Americans. Yeah it could be possible because of fast food and lazy lifestyle. Less walking and the most important factor i think the food reach to consumers after a lot of process. its rarely available fresh food as i know.